Taus is an urdu word which means peacock. The shape of taus looks like a peacock therefore its name prevailed taus. 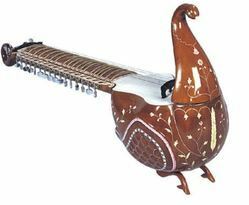 taus is a different kind of sitar itself. 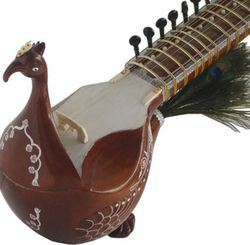 The difference between a sitar and a taus is its disk. In case of taus the disk is made-up of leather. And for sitar wooden disk is fitted under the bridge. taus making is rarely found any where as it needs special skills. - Made from choicest and well-seasoned piece of wood, fitted with special machine heads for tuning, special adjustable bow, Excellent decoration, professional quality, extremely rich tonal quality. Made to order only. - Note: - Color or pattern may differ from image.